You cannot steal from someone who has nothing of value and has never worked hard or earned it. I'm not saying that things are easy or that unemployment is not an issue. It is. I'm saying that things are not worse than they were for many of us. Sure, if a 2010 grad compares umemployment rates the year they graduated (9.6%) with rates in 2006 (4.6%), things are worse. But if they compare the rates to 1982 (9.7%), things are not. I graduated from college in 1982. Jobs were scarce. Interest rates were crazy high. Competition for jobs was fierce. At 22 I did find a job, but not easily. In fact, I wouldn't say much in life has been "easy". I truly feel sorry for the 99%ers who are in a bad place despite their best efforts or due to unavoidable health issues. I even feel sorry for the 99%ers who are in a bad place due to their bad choices. I just don't think they have a leg to stand on when they blame Wall Street or the Fed or the Government or whomever when they are the authors of their own lives. I don't want to be the 1%. 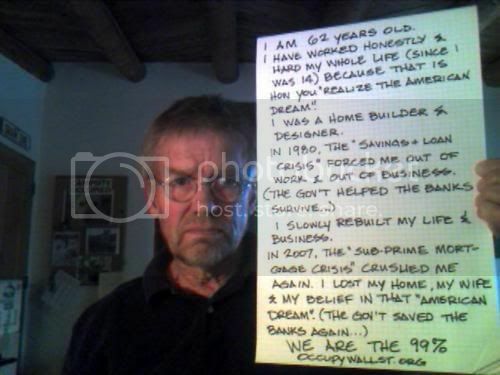 I am happy being in the 99% and thankful for what I have achieved. I don't need the government to make it. Times are hard and I have had my share. I have learned that hard work keeps the wolf from the door. Think things through. See where one is vulnerable and look at risk. Save money in the good times . Live below your means and be happy doing it. All work is honorable.. it pays the bills. I was let go when from my company when Chrysler and GM were allowed to go bankrupt and not pay thier bills. My company lost 2 million dollars. I felt sorry for myself for about a year. I had a truck and a trailer and was determined to do something to make money. Now I am so busy I sometimes have to turn down jobs. You people out there can do the same. I believe in people of this country not the Government. Good luck to all of you. Now go get busy. Was gonna rep ya' but I have to spread some around first. You go Newman! That's the spirit of a true American. You get knocked down, you pick yourself back up again. And again. And again. And you never quit. "These colors don't run." Pay for your own darn education!!!! You have been fortunate. Right now, there are millions of Americans who, like you, earned and worked but did not have a good outcome (you label them as "losers"). Would you be so so condescending had you lost your job, your investments tanked, or your retirment plan suddenly collapsed? Switch to the History channel. I'm tired of watching "The Third Reich's Greatest Hits".